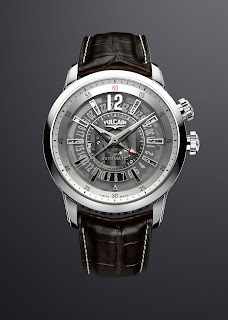 After the success of its Anniversary Heart model, of which one was gifted to U.S. president Barack Obama, Vulcain presents a new version of this subtle and elegant watch, this time driven by a self-winding movement. Equipped with the new Cricket V-28 alarm calibre, the ANNIVERSARY HEART AUTOMATIC features an openworked dial revealing the meticulous finishing of this legendary mechanism. Hardly had it emerged from the workshops of the Manufacture Vulcain in Le Locle, than the Cricket Anniversary Heart found its place in the history books. Gifted to Barack Obama in accordance with an over 50 year-old tradition that has earned the Vulcain Cricket the title of “Presidents’ Watch”, this timepiece was duly appreciated by the new occupant of the White House who expressed his gratitude to the watchmakers in Le Locle. 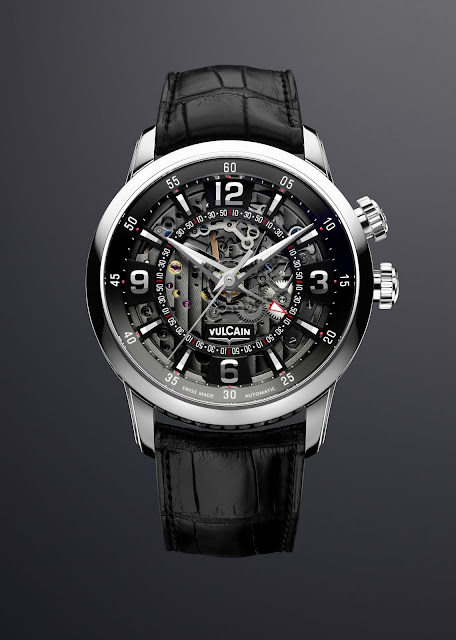 Keen as ever to pursue the evolution of its collections, Vulcain is presenting a self-winding version of its Anniversary heart model in 2010. 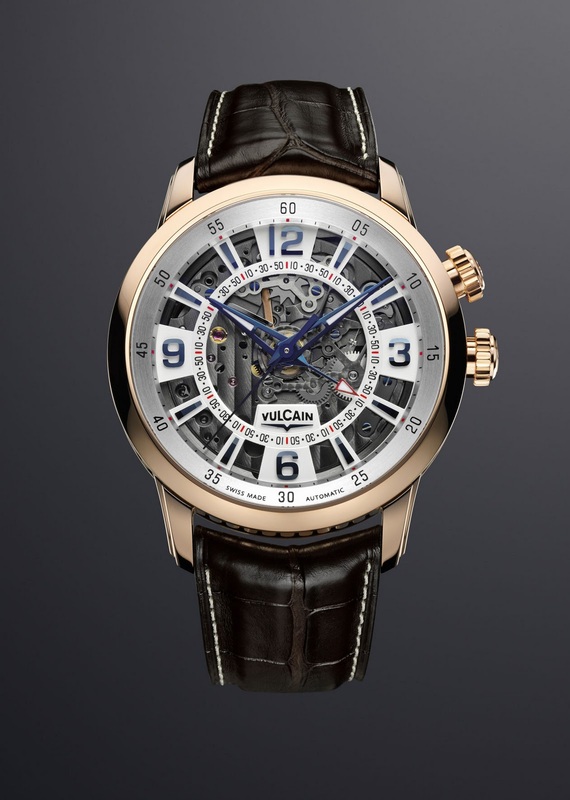 The partially skeletonised dial of this alarm watch reveals Vulcain Cricket Calibre V-28, a mechanical self-winding movement distinguished by its anthracite coating and meticulous finishing characteristic of haute horlogerie models. The anthracite-coated oscillating weight equipped with a ceramic ball-bearing system ensures unidirectional winding. The 221-part Cricket Calibre V-28 is equipped with Vulcain’s patented Exactomatic system guaranteeing regular amplitude and enhanced rating precision. It twin barrels ensure a 42-hour power reserve and a 20-second chime. It also drives the hours, minutes, central seconds and alarm functions. The new face of the ANNIVERSARY HEART AUTOMATIC model features four Arabic numerals – instead of the previous single one – shaped like the eight other bevelled hour-markers. The hands are also openworked to accentuate the airily light nature of this model and to provide a better view of the meticulous finishing on the anthracite movement. 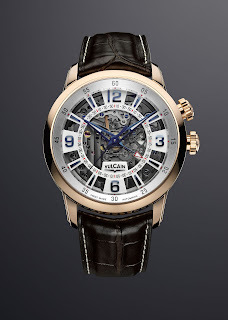 The 42 mm-diameter case is available in a choice of steel or 18K rose gold and features a fluted caseband, a sapphire crystal and a case-back enhanced with the stylised “V” for Vulcain in steel or rose gold. The dial is black or silvered on the rose gold version, and black or bronze for the steel model. The case is guaranteed water-resistant to 50 metres. The Louisiana alligator leather strap is fitted with a gold pin buckle for the 18K rose gold version or a safety folding clasp for the steel version. Vulcain proprietary Cricket Calibre self-winding alarm, double barrel, 221 components. Equipped with the Exactomatic system guaranteeing regular amplitude and enhanced rating precision. Functions: hour, minute, centre seconds, alarm.